Bank robbery isn’t as easy as it looks, especially when things don’t go as planned. 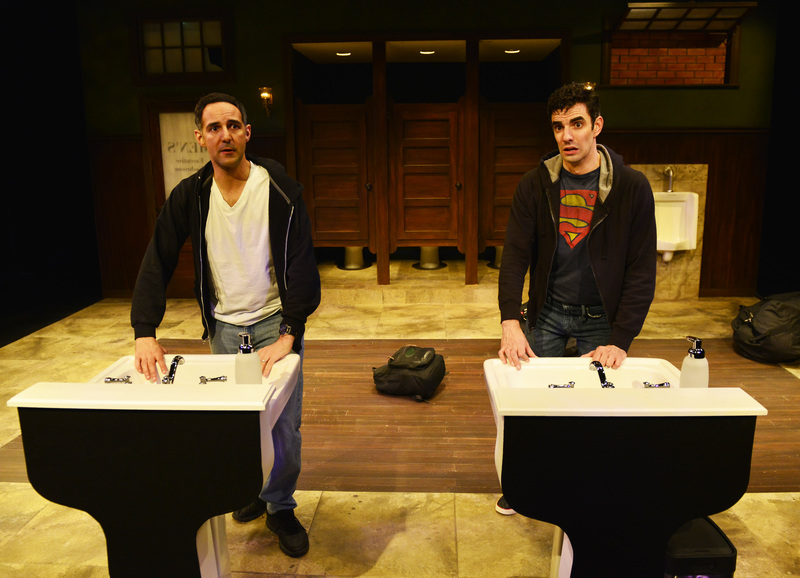 That’s the lesson that two brothers learn early on in John Kolvenbach’s comedy The Bank Job, currently at Gloucester Stage. Fourteen million dollars is a nice haul, but it won’t do you much good if your escape plans hit a brick wall – literally – and you find yourselves trapped in the bank’s executive washroom with the police closing in. That’s exactly where novice bank robbing brothers Russell (played by Paul Melendy) and Tracey (Nael Nacer) find themselves, with no backup plan – or at least not one they can agree on. While they bicker over whose fault it is, they hear over their police scanner that an officer is on his way to search the executive bathroom. They quickly hide themselves and their ill-gotten loot in two of the three stalls just seconds before officer Dale James (Johnny Lee Davenport) enters with gun drawn. Without bothering to check the stalls, Dale quickly concludes that there is no one there and takes the opportunity to enjoy a leisurely stop at the urinal all the while humming a funky tune. He then goes to the sink to wash his hands but seems more interested in admiring his reflection in the mirror than any police investigation. It’s only while stuffing some mints into his pocket from a table next to the sink that he spots the pistol lying next to the candy dish and his investigative instincts click in. Dale gets the two hapless hoods to come out of their stalls. When he commands them to get down on the floor, Tracey lies on his back. But it turns out that there’s a fourth party in the washroom. Unbeknownst to any of them, young bank teller Jill (Shuyi Jia) had decided to take advantage of the executive washroom and was in the third stall when robbers burst in. She sticks a toilet paper spindle in Dale’s back and orders him to hand over his gun and join the robbers on the floor. Before long, we learn that everyone in the room has their price and soon they are negotiating ways to split the loot. 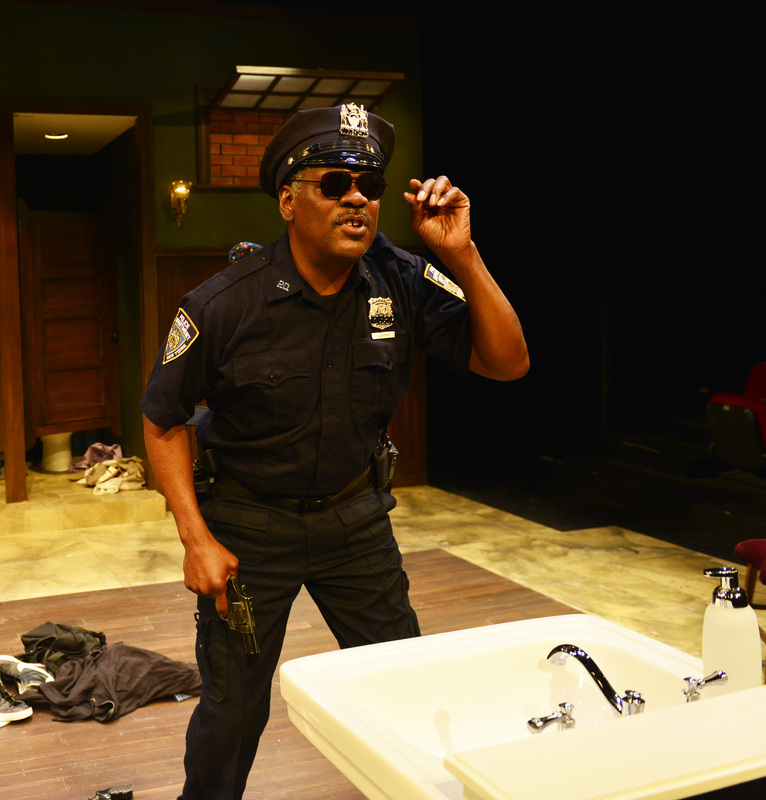 Over the course of events, Officer Dale emerges as the most down-to-earth of these quirky characters, and the only one with an ounce of self-awareness. “Today, I was a rich man for about three minutes,” he laments later, when escape looks unlikely. It’s not until this gang that couldn’t shoot straight decides to take hostage a bank executive (played by Richard McElvain) that we learn that Russell and Tracey come by their larcenous tendencies, well, honestly. Director Robert Walsh does a nice job coordinating the chaos into a fun evening at the theater. Best to deposit your logic at the door, however. Being a madcap comedy, The Bank Job demands a certain suspension of disbelief. In return, it pays dividends aplenty in the form of laugh-out-loud lines and more than a few plot twists along the way. 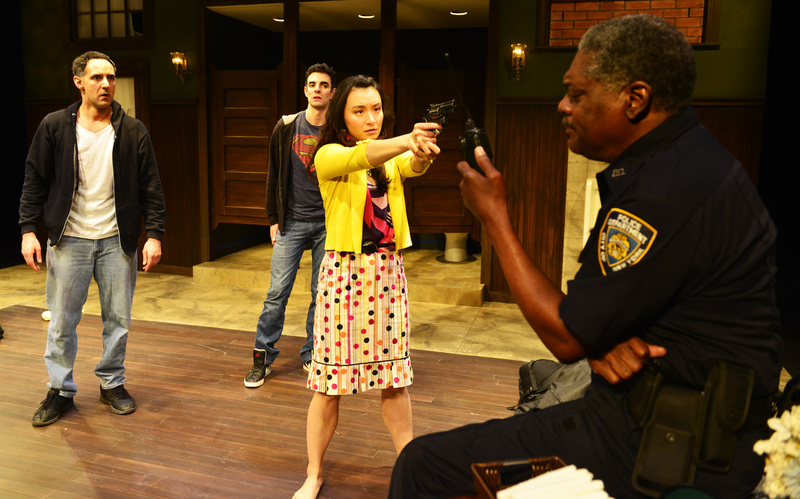 The Bank Job runs through June 10 at Gloucester Stage, 267 East Main St., Gloucester, Mass. Performances are Wednesday through Saturday at 7:30 p.m., Saturday and Sunday at 2 p.m. and a special Tuesday performance on Tuesday, June 6 at 7:30 p.m. Purchase tickets online, or phone the Box Office at 978-281-4433.